How Does A Jet Swet Kit Work? Jet Swet Plumbing Plug's are used to stop water from leaking out of a line when you need to weld or solder on a fitting. The Jet Swet Kits are the most cost effective way of purchasing multiple sizes when you have jobs with different size pipe to repair. A jet Swet Kit is light and easy to carry onto any job site and is the standard in the industry. 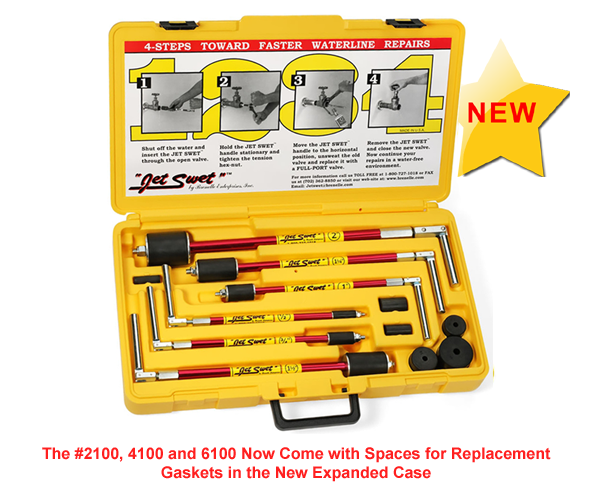 Jet Swets™ have been and are the original, most professional, best made plug tool for over 20 years now. There have been and are various knock-offs that come and go, but Jet Swets™ stand up against them all, and are still the market leader for this kind of tool simply because, Jet Swets™ are made better. Jet Swets™ are made of better quality materials, and are designed, and constantly refined by master plumbers to be far superior to any other product on the market. They are available in seven different kit configurations form 1/2" to 2.00" to meet every application type.